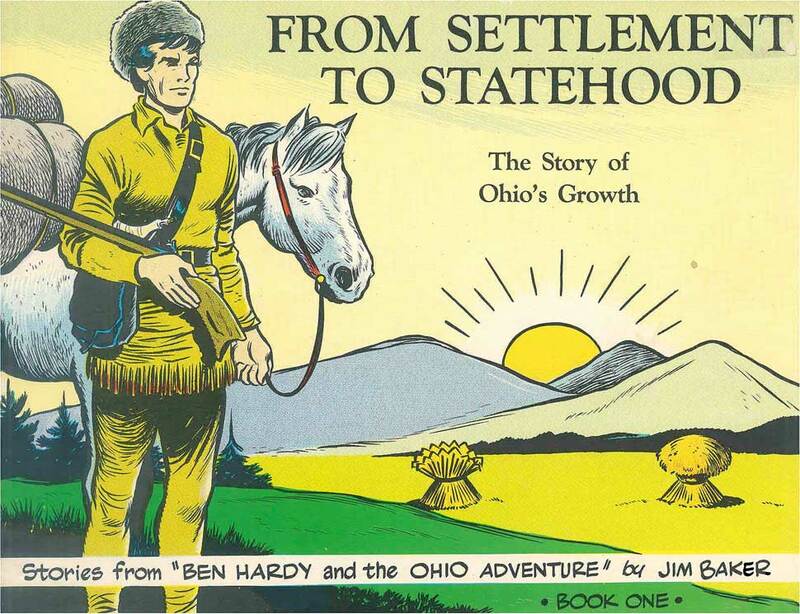 Something a little different for the United States' Independence Day: Ben Hardy & the Ohio Adventure. 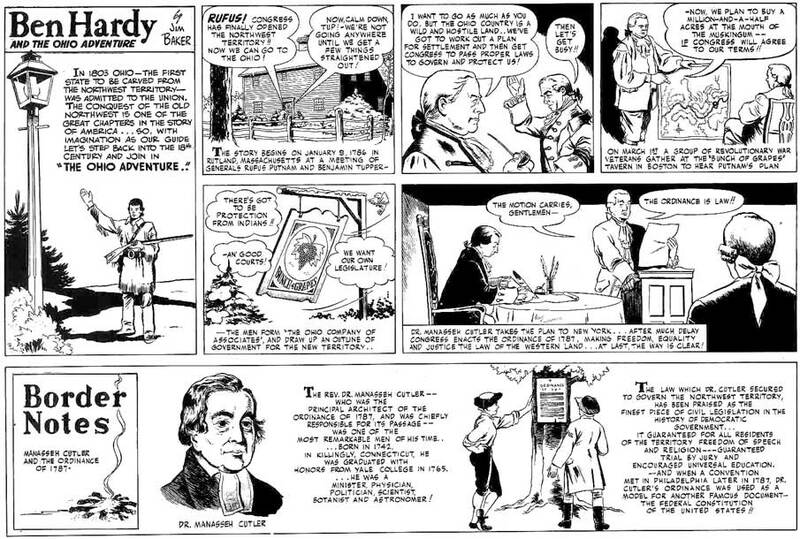 This was a comic strip by Jim Baker that began running in The Columbus Dispatch starting in September 1952. 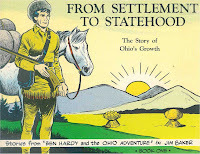 It relayed the story Ohio's settlement and rise to statehood. 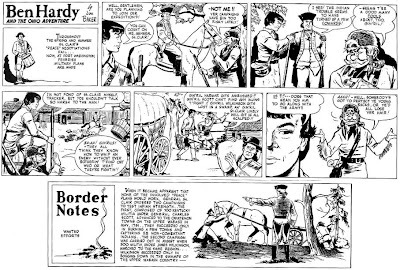 Although it's obviously a very white-washed look at things -- hardly surprising given the culture of the 1950s -- Baker does do an excellent job, I think, combining comic storytelling with education. 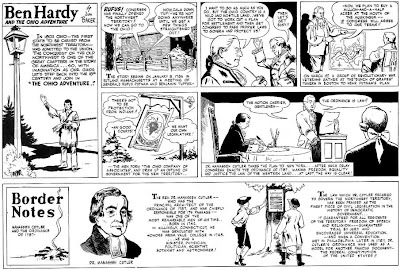 Many of the attempts at educational/historical comics I've seen rely very heavily on conveying facts and figures. They end up being illustrated textbooks really. But Baker use the Ben Hardy and Tracker Dean characters as protagonists that witness the unfolding events, a method similar to what was later seen in Forrest Gump. 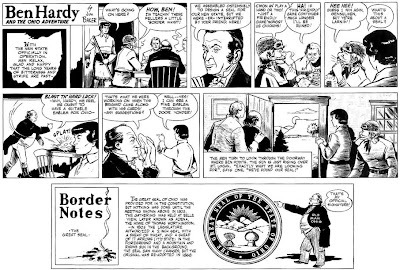 I think this makes for an effective technique for keeping the story moving along without bogging readers down with lots of dry facts and figures, though Baker does provide some of that with the accompanying "Border Notes." Baker himself was born in Kentucky, but raised in Ohio and studied political science and art at DePauw University in Indiana. He eventually settled down in Worthington, Ohio and began working for The Columbus Dispatch in 1947. I can find record of Baker authoring about a dozen books all focusing around the American frontier in the late 1700s/early 1800s, primarily the Ohio and Mid-West regions. Presumably, all of them are drawn similar to what you see below. I can't find a record of Baker's death, but he continued publishing at least through 1976. These examples come from a 1965 comic book collection of the Ben Hardy strips that Baker self-published. 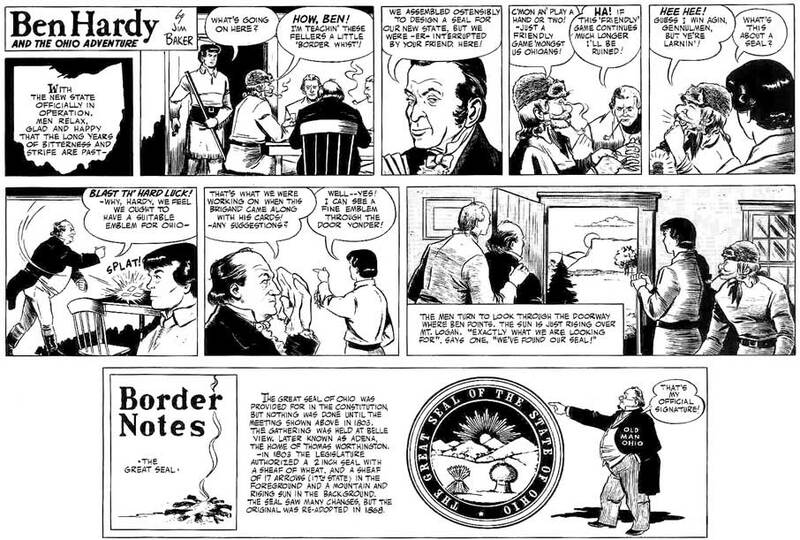 I was going through some of my deceased father's things who was the managing features editor of the Columbus Dispatch, and found several full color master prints of this comic strip enclosed in some sort of sales folder. These are mint condition other than they are folded in half to fit into the folder. Anyone have any clues if these are worth anything?